Edmonton, Alberta--(Newsfile Corp. - February 27, 2019) - Benchmark Metals Inc. (TSXV: BNCH) (OTCQB: CYRTF) (WKN: A2JM2X) (the "Company" or "Benchmark") is pleased to report 1751 hectares of new claims added to the Lawyers Gold & Silver Project, located in the prolific Stikine terrane of the Toodoggone Mineral District, which also hosts the Golden Triangle region of British Columbia, Canada. 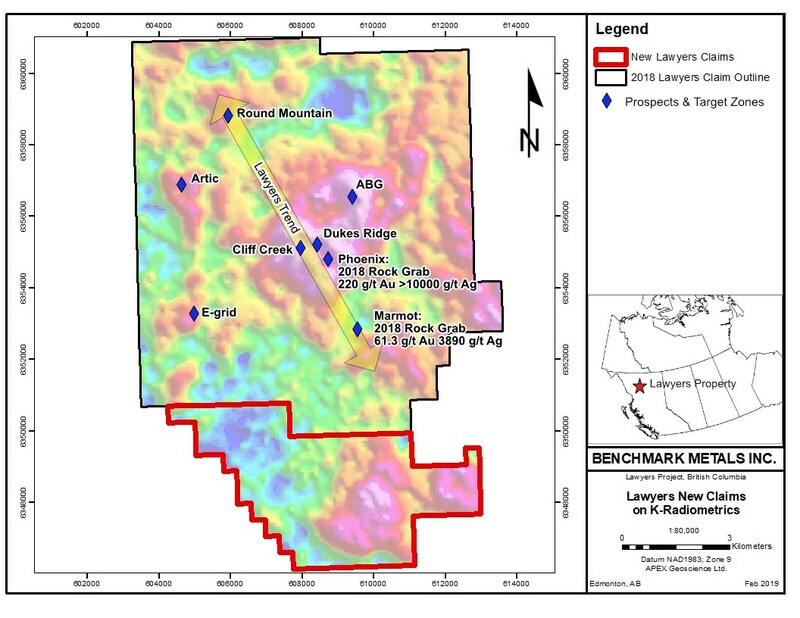 The new claims are contiguous to the southeast, increasing the Lawyers land package to nearly 120km2, and highly prospective for additional gold-silver mineralization. CEO John Williamson commented, "The Lawyers Trend is emerging as an important regional scale prospect that follows a linear magnetic and radiometric anomaly with a northwest to southeast orientation connecting multiple gold-silver showings across the Lawyers land package. Several lines of evidence now support the potential that this anomaly may represent a regional scale structure providing a conduit for gold and silver bearing fluids." Benchmark retains 100% in the new claims that contain highly prospective host rocks and an important unconformity between the Stuhini Group and the lower Toodoggone volcanics. This stratigraphic horizon is an important marker, with many of the deposits in the Gold Triangle and the Toodoggone Mineral District concentrated along it, including Brucejack, KSM, Baker-Shasta and Dolly Varden. The horizon cuts through the new claims with more than half of the new ground covered by the Metasan member of the Toodoggone volcanics, which is host to all known mineralisation along Lawyers Trend. The Toodoggone Mineral District contains several significant epithermal and porphyry mineral deposits. In geological terms, Toodoggone represents the eastern extent of the prolific Stikine terrane, which also hosts British Columbia's Golden Triangle region. Toodoggone and the Golden Triangle are thought to be parts of a deeper and continuous mineralized system, which was overlain by the younger sedimentary rock of the Bowser and Sustut Basins that now separate them. Lawyers Trend is hosted by the same rocks as the Golden Triangle, within the same highly prospective setting of tectonics, volcanic sequence and mineral deposition. The following location map provides new claim orientation and its potential to add new targets that may trend southeast of the Lawyers Trend.